"rol lam" proudly reads passages from his work. 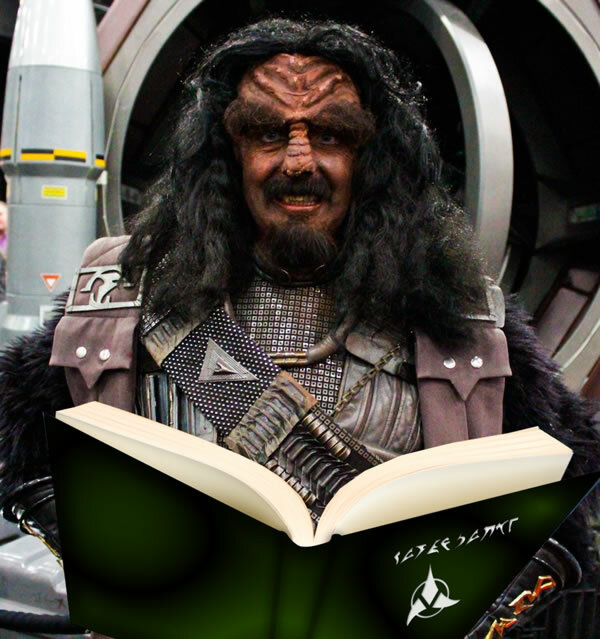 ARLINGTON HEIGHTS, IL – Speaking before a small crowd gathered in a residential basement earlier today, a group of cosplay Muslims proudly unveiled their Klingon translation of the Holy Quran. Repeatedly asking reporters refer to them as a qorDu’, the clan was led by a rotund man known only by his pseudonym of “rol lam”. The clan’s original vision was to create a Muslim Klingon conference. That idea fizzled, however, after realizing their numbers are disappointingly low. “Plus, many folks couldn’t get their parent or legal guardian’s permission,” explained the 47-year old single man, allowing his gaze to drift momentarily and reflect on the choices that led him to this point in life. He was supposed to be a doctor. Why couldn’t he get his life together? The press conference was followed up with a live reading of the translation. Unfortunately, many left after refreshments were depleted approximately a quarter of the way through Surah Al-Baqarah.